Have you ever been window shopping and seen a gorgeous piece of French furniture and fallen in love with it, only to flip over the price tag and nearly die of shock!...Well, no longer as ChalkPaint™ decorative paint by Annie Sloan has made its way to New Zealand's shores and is available at Fenwick Vintages, Paraparaumu, Femme de Brocante, Rangiora and Papillon in Cromwell. 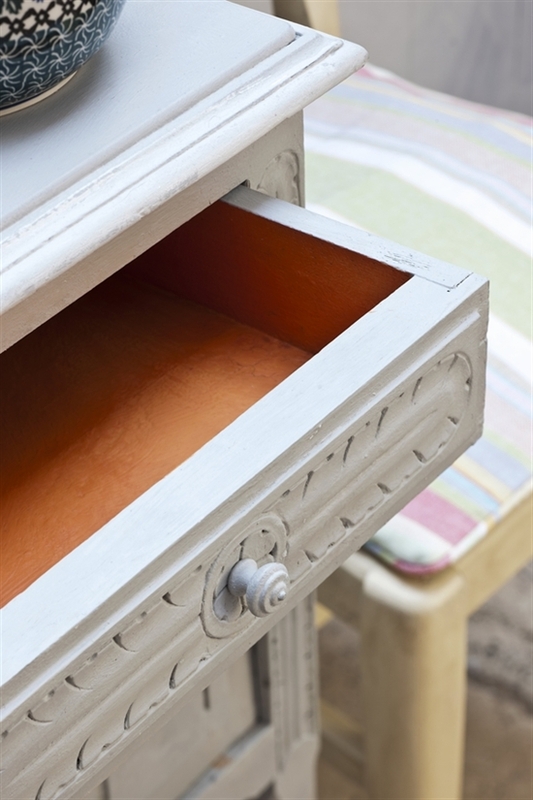 Using Chalk Paint™ you can achieve fantastic results, from old and tired, to fresh and fabulously French with absolutely no tiresome prep work. As a blogger and avid blog reader, I am well aware of the triumphant results of DIY bloggers. Bloggers who turn a yard or garage sale bargain into a stunning piece of furniture that looks like something out of House & Garden. Some of the makeovers are so gorgeous it makes you wonder, "Could I possibly achieve these results myself?" With the recent research on Chalk Paint™ decorative paint by Annie Sloan, I believe we can and I have two volunteers, plus myself who are going to have a go at refinishing/upcycling some furniture using Chalk Paint™ . I just want to add, when I talk of Chalk Paint™, to those of us in New Zealand who may not be familiar with the name, it is NOT the same chalk paint used to create a blackboard effect, the chalk in Annie's paint is just one of her secret ingredients for her safe and odourless paint. The name is derived from the paints matt, almost chalky finish. 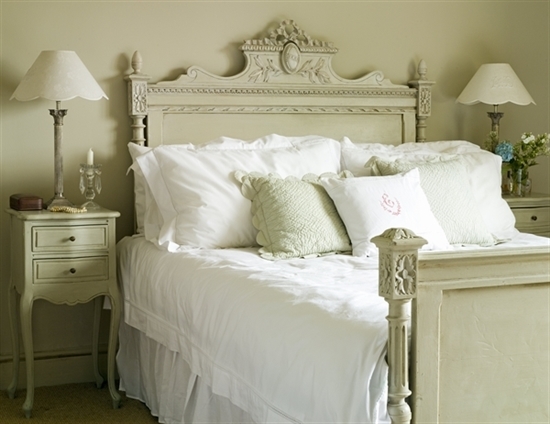 Chalk Paint™ was developed by Annie over 20 years ago and has been said to have revolutionised decorative painting. The matt velvet finish of Annie's paint can also have a subtle sheen added by applying a coat of Annie's soft wax which gives added protection. 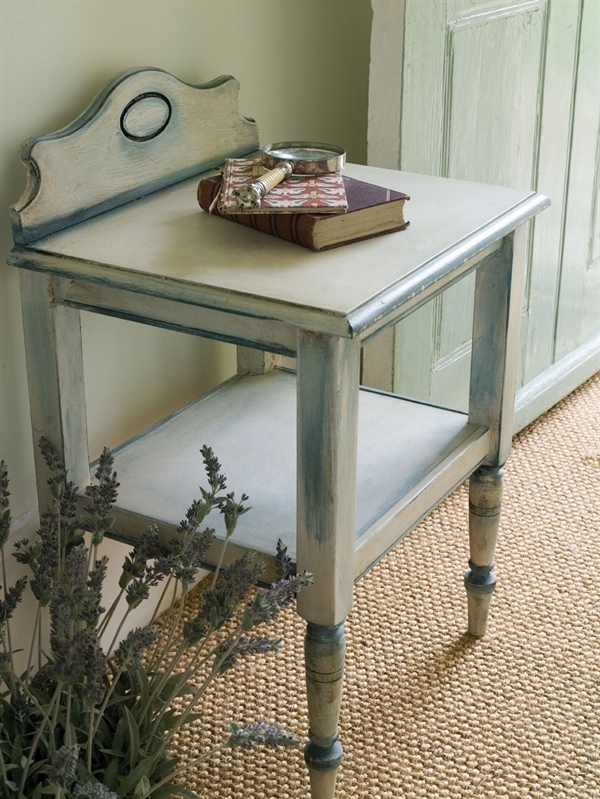 Chalk Paint™ decorative paint by Annie Sloan in 'Provence', followed by clear wax, tinted olive wax and a finishing touch of gilding wax. I think Danielle did an amazing job and it makes me a little upset that I gave away my mums old mahogany coffee table, It was not as beautiful as this but it certainly had the potential to be. You can find step by step instructions for this paint technique at Danielle's blog, Silver Pennies. While typing this post I heard a knock on my door, Poppy leapt off the sofa and raced in front of me giving her BIG dog bark interpretation. I opened the door to see a rather hesitant DHL delivery man holding a package from the Annie Sloan company looking as if he'd expected a Rottweiler, not a tiny toy Schnoodle ,wagging her tail ninety to the dozen. 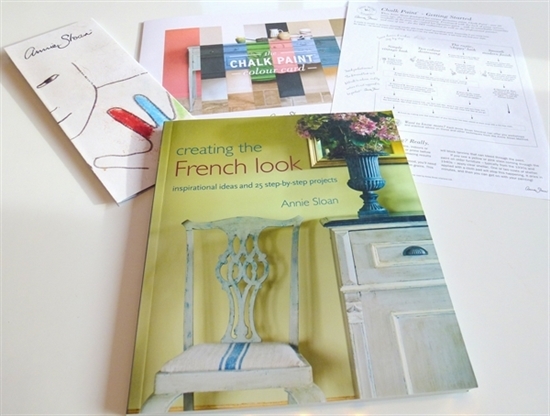 I had been expecting the package and quickly opened it to see a copy of Annie's book, 'Creating the French Look' plus the Chalk Paint™ colour cards. I am literally jumping up and down and probably all over the place with this post as the colours are to die for. Soft pastels such as 'Louis blue' for a Rococo look, 'Provence' a deeper blue/green, reflecting the colours of old doors and shutters in the South of France. Brighter colours such as 'English yellow', an amazing deep yellow inspired by hand-painted Chinese wallpaper, not to mention, 'Antibes Green' a colour found in the rustic country furniture of Ireland and the South of France.....oh! and I can't miss out 'Greek Blue' which to me is like the meeting of the sky above with the sea below. 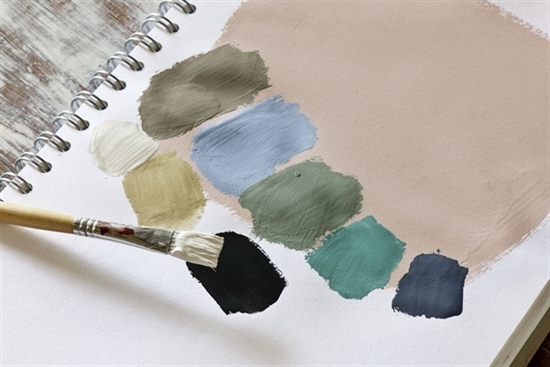 There are 27 wonderful colours plus a neutral range of 5 colours of which I love the 'Paris Grey'. Eligibility for the book give-a-way, 'Creating The French Look' is to simply add yourself as a follower and leave a short comment below this post or on my Facebook page telling me why you would like to win the book and what your first makeover might be? The competition is worldwide, as long as you can provide a postal address. The winner will be chosen on the 27th of September, so don't forget to check back as I will announce the winner and include an email address where you can contact me to provide your delivery address. I have just been thumbing through the book, it's absolutely gorgeous and contains lots of beautiful images, including 25 step by step projects, imagine what beautiful makeovers you could achieve if you won a copy of 'this lovely book. I have taken a few photos to share with you, don't worry you will have a brand new copy so there will be no dog-eared pages ☺. I am also excited to be collaborating with Olivia of Lucille in Wellington and Kaye of Curtainalia & Bel Cuscino in Auckland, both will put the Chalk Paint™ and finishing wax to the test, I am really excited about seeing their results which will be shared on Lee Caroline once they are finished. 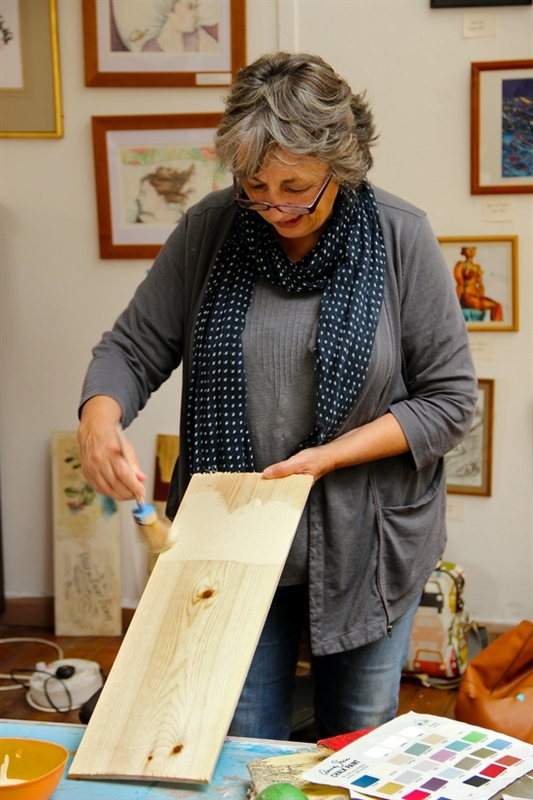 Olivia will be working on two pieces and Kaye is going to re-paint an ornate antique, French dressing table. Myself, I will be repainting a piano stool and a chest of drawers and I can see it will be terribly hard to narrow down what colour I will choose. It seems that Annie's paint is as creative as your imagination allows and I can't wait to try it out myself. Chalk Paint™ is currently available at the following stockists, (click on the link to find your local stockist). Addendum April 2014: If you live in Auckland, Chalk Paint™ is now available at Le Monde in Parnell. If you want ideas on ways you could use Chalk Paint™, please check out my Paint Effects board on Pinterest for lot's of inspiration, then pop over and watch Annie's video with step by step techniques using ChalkPaint™, Annie also has a lovely blog and her own Pinterest page. Don't forget to leave your comment below, or on my Facebook page and add yourself as a follower to be in with a chance to win a copy of Annie Sloan's book, 'Creating the French Look'. The winner will be announced on the 27th October NZST (New Zealand Standard Time). The competition is open to anyone. 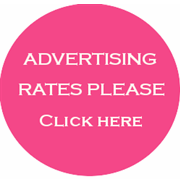 You may want to sign up for email, on my side bar, so you don't miss out on these makeovers. Oh, such an exciting giveaway! I would love to try my hand at painting some pieces and have heard so much about chalk paint. The book must be amazing! Thank you for entering me! I have just been looking through all the colours again, they are wonderful.If you win the book will be very inspiring for you to paint your chairs Marianne. Hello, love your blog and the giveaway! 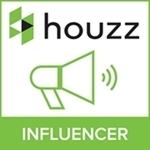 Have just started following! Thank you for entering and adding yourself as a follower. Yes it has taken some time to reach our shores but finally here...yay! I would think that spacecote would not be durable enough for furniture and would rub off easily if knocked. Annies paint has great adhesion and durability, however, I admire the fact that you took it on yourself to try something out when it wasn't available. To be eligible to win the book, I would need to know who you are as you have come up as 'anonymous' which means I am not able to contact you. If you have a Facebook page, you might be best to leave a comment over on my Facebook page to be in with a chance to win this inspiring book. This way I am able to contact you should your comment be chosen. Hello, I found you through following Annie Sloan's FB page where she posted your give-away. I am now following your blog, and will like your FB page when I'm done posting. I have just done my 1st item using ASCP and it did NOT turn out like the beautiful pieces you have on this post. Thank you for your comment and entry Jennifer, possibly you may have needed to use the soft wax which Annie has. This will add a subtle sheen to the chalk like, matt finish. Oh how would love this book! I purchased four colors of paint, the clear and dark wax, two different brushes. I then went to goodwill and garage sales to look for pieces of furniture. I have about six pieces sitting in my garage. I did paint a little bar stool but just one color. I so love the color mixes and the different looks but I'm scared to try so they just sit. I can understand how you feel, I am an artist and when I stand in front of my blank canvas, all prepared to start, I get what artists call "White Fright". I think however, if you do win the book you will be inspired and won't want to waste any time starting. I have only looked through it and so excited about receiving my paint to start my own project. Hi there. I'm from Cape Town in South Africa and have just bought my first chalk paints, so excited to start painting and will do so as soon as we've finished the shopfitting. 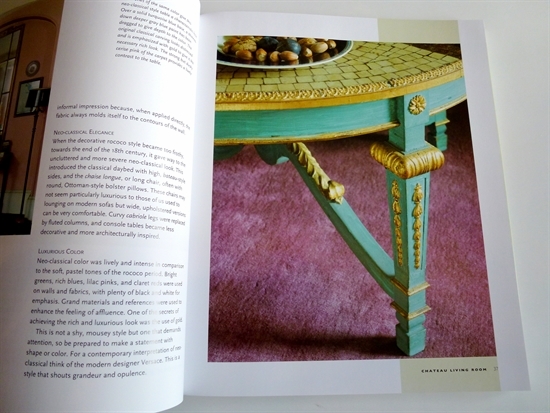 I'm starting a gifts and decor shop mid October and could soooo make use of the book to make beautiful furniture... and materials... and gifts... and anything and everything! Hi Xtine, thank you for dropping by, good luck with the competition. The book would give you lots of amazing ideas for your store. How exciting for you to open a shop. You could create some wonderful pieces of furniture for it, Annies colours are amazing...good luck. Thank you so much Lee, I'm super exited about everything. We've only had chalk paint in SA for the past 4 months, I've just been to a beginners' workshop and saw the book there. It looks absolutely stunning, definitely an asset for anyone wanting to beautify their home. I have just started painting furniture & need all the help & inspiration I can possibly get! Good luck Berzett, the book is certainly full of inspiration. Thank you for your comment Vanessa, yes many makeovers on the internet, some are absolutely fabulous, like you I am a little scared, however Annie's book gives clear instructions and I cannot wait for my paint to arrive. I've always loved this look Lee. 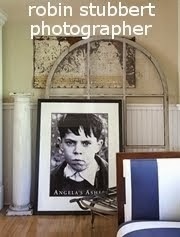 Years ago my mother 'white-washed' an old marble top table - it's all white including the marble. Now I can go on and do the rest of my furniture with this paint. Thanks Lee for sharing. 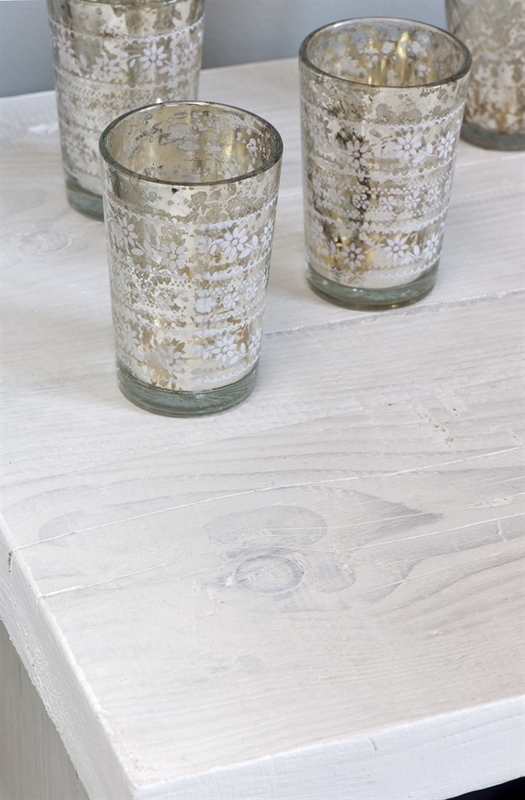 I love white wash too Kellie, I think with a thin layer of Annie's paint you can achieve a white washed look. Haha! You made me laugh talking about getting your book in the mail. 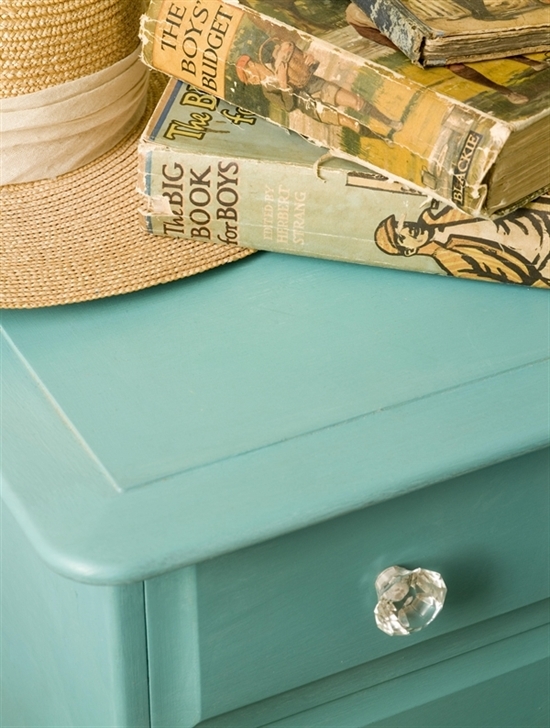 I love Annie Sloan chalk paint. 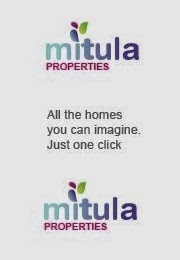 It is so versatile, and the colors are great. I have yet to actually wax anything because i can't commit to finishing when i may want to change the color again! The other problem i have with it - is deciding what color and finish to paint on things.... there are too many great choices! I know you'll have fun with your chalk paint... and the french gray is great, but so is country gray! Do you know Amy of 'Maison Deco'r? She has a blog "maisondecor.blogspot.com" and she does all kinds of cool stuff with chalk paint. Thanks for stopping by Cindy and catching up with my blog. I know that Annie's paint has been in the USA a while so you will be more familiar with it than I. I guess like you say you need the colour exactly right before you apply your wax. I am going to use French Grey. I will check out the blog you told me about, I think I have seen her blog from time to time. 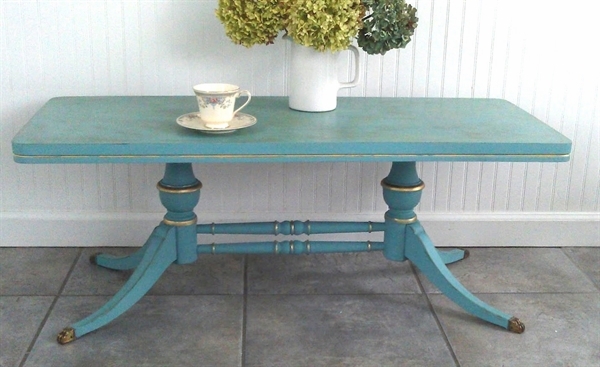 There are so many bloggers that re-paint furniture, some are stunning. I will check her blog out again. Just discovered your blog - wish I'd found it in September when you were giving that book away - just looked at that very book online a few minutes ago! I've just bought my dream home which needs renovating and I'd love to do it in French Country - I live not far from Paraparaumu and can't wait to check out the chalk paints I saw there the other day. What a shame you just found me, still I hope you will follow along. I am actually working on a project at the moment using a different type of paint that is available in New Zealand. This is a coastal style makeover on an old rimu trunk, it should be up on the blog in the next week or so. 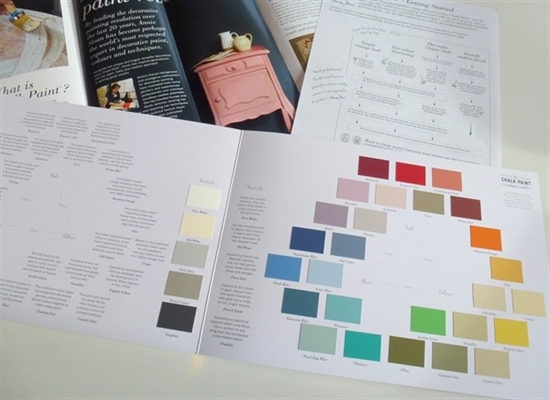 Annie's book, 'Creating The French Look' is really good but if you are after doing some furniture makeovers, I also recommend her book 'Colour Recipes For Painted Furniture'. If you want any advice or help re the chalk paint, please do not hesitate to contact me at leecarolineart@gmail.com. Would love to see photos of your dream home renovations Susan.